At 4am, on Friday morning January 27th, hundreds of volunteers left dozens of deployment centers throughout San Diego to count homeless people. Called, “We All Count,” this annual enumeration of homeless people in San Diego is run by the San Diego Regional Task Force on the Homeless. 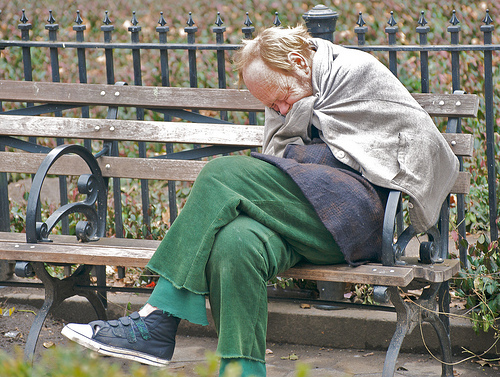 The US Department of Housing and Urban Development (HUD) has mandated that beginning in 2005, agencies receiving HUD funding needed to count the homeless people in their cities on a bi-annual basis. One of the goals of this point in time count is to provide a snap shot of homelessness during the last week of January every two years. The results of this count are used to justify the funds being sent to the recipient agencies to help homeless people within their cities. I and a homeless friend, were two of these enumerators. We drove up and down designated streets and alleys of Ocean Beach counting homeless individuals and vehicles potentially housing individuals. The third category we could have counted were “hand-built structures,” but we did not see any during our drive. During our over two-hour drive in Ocean Beach, we counted over 60 homeless individuals and 100 vehicles which were potentially housing individuals. Although the count may sound very dry for some of us, I was touched by a number of things we saw. For example, in one alley, we saw a carport where four homeless individuals were sleeping a person-apart from each other. They were sleeping on the cement with apparently no ground cover and no blankets. Currently, volunteers, including myself and my homeless friend, are conducting surveys of homeless people on behalf of the Regional Task Force on the Homeless. These surveys are intended to ask those people who were homeless on the same morning as the count specific personal information about them, questions about what are their sources of support and why they are homeless. In return for answering the over 100 questions presented to them, the homeless person receives a $10 gift card to Subway. All surveys are intended to be completed with days of the count. Thank you Christine for your volunteerism and insightful article! And thank you for your training session so that those of us counting could feel comfortable with our efforts. Hi i have couple of questions can you help me if there is any projects building something for the homeless people or getting destriot or kicked out i needed for my school projects thank you. Newer Article: Hallelujah! the Brighton Street Beach Restrooms Are Under Construction !